Grocery stores keep bins of apples stocked, and apple picking is one fall activity for families and kids of all ages that leaves lasting memories. Luckily for you — with all the apples you’ll inevitably have on hand — apples are an extremely versatile fruit, and not only for baking pies, cooked down in sauces, made into cider, and munched in their pure, raw form. 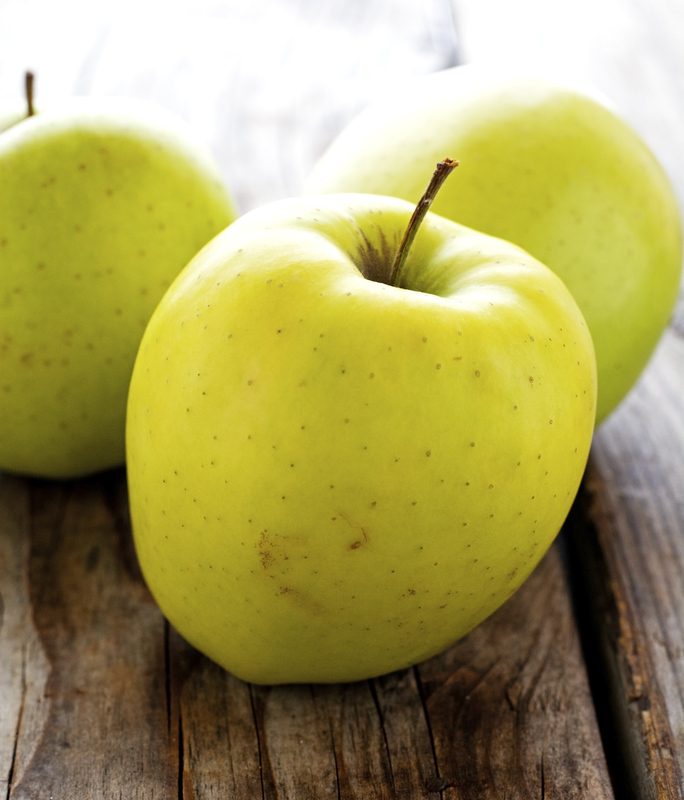 There are so many other amazing things you can make with apples, such as blend them in soups. Seriously guys, apples do so well in soups. Take this Apple Butternut Squash Soup for instance; even without added cream, it takes on a luxuriously velvety texture after it’s pureed that’s just incredible. 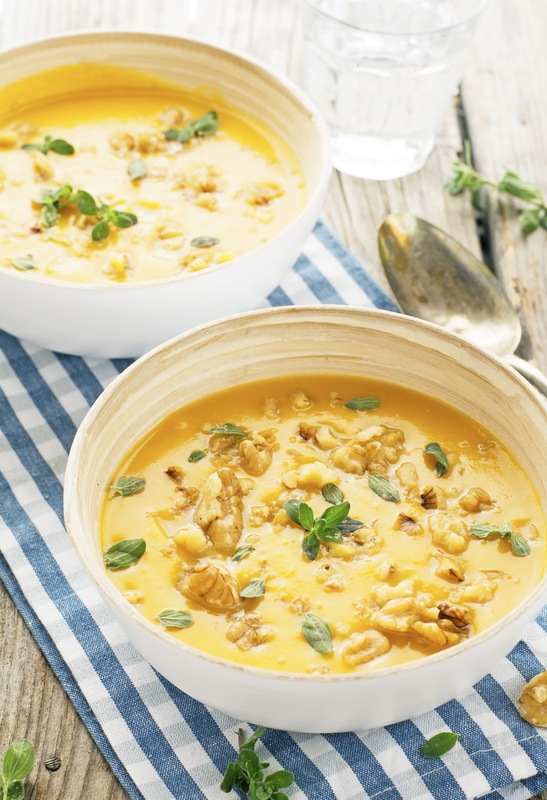 And when it comes to the taste, this soup combines the warm comfort of pureed butternut squash with the sweet and tart flavors of apples, while the ginger adds a nice punch. In addition to the incredible flavor and heartiness of the soup — my friends were impressed by how “hearty” this soup tasted without any noodles, rice, or other protein — this is one of the quickest soups I’ve ever made. It took less than an hour from the moment I started peeling and chopping the butternut squash until I was ladling myself a bowl. Being able to whip this soup so quickly makes it a perfect weeknight. But if you serve it topped with walnuts and marjoram (like I did) it’s sophisticated enough for company. And so, you’re just going to have to make it yourself. And I promise, you’ll be surprised how delicious this is. 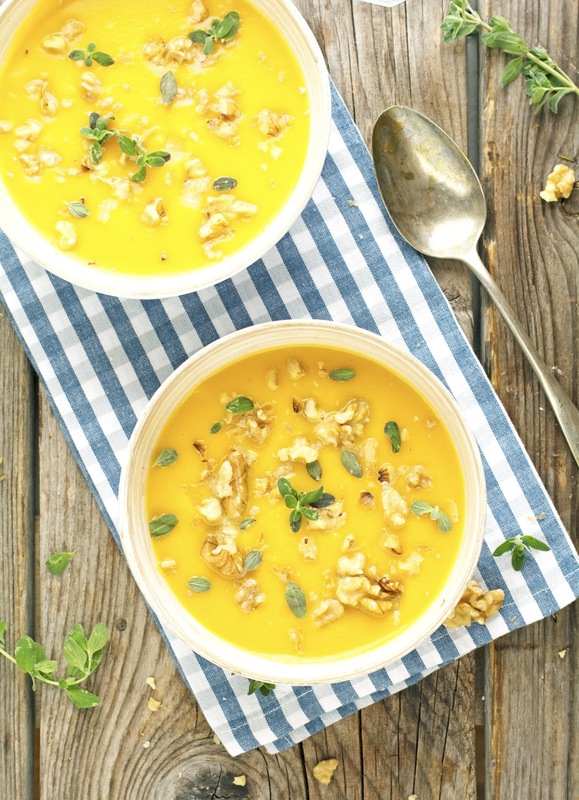 (Vegan) Apple and Butternut Squash Soup with Walnuts and Marjoram Print this recipe! Melt butter in a large pot over medium-high heat. Add onion and sauté until translucent, about 6 minutes. Add ginger and sauté for 30 seconds, until fragrant. Add butternut squash and apple and sauté for 2 minutes. Add vegetable broth and ground black pepper, bring to a boil, lower to a simmer and cook for 15 to 20 minutes or until the butternut squash is cooked through. Remove from the heat and puree with an immersion blender. Take a taste and adjust seasoning as needed (I added 1 teaspoon of salt). 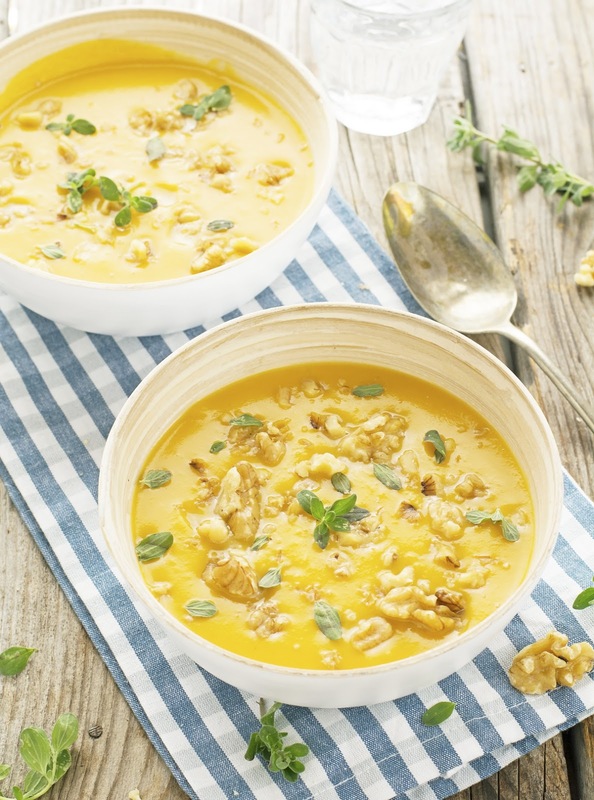 Serve soup in bowls topped with walnuts and fresh marjoram. One serving yields 291 calories, 19 grams of fat, 27 grams of carbs, 5 grams protein. Yum. I just posted a Butternut squash soup recipe today that I found on Pinterest. Will have to try this one as well. I like this, I've never tried a soup recipe with apple! Sounds like a great idea, and the ginger is a good addition. I bet this soup is wonderful Mike, love this combo. I do not have many apple recipes in my repertoire either. Butternut squash soup is one of my favorite seasonal dishes, and with walnuts it's even more delicious (and yes, sophisticated). But apples? Never tried, but if you say they work well in this soup, I will definitely try. Good job, Mike! This soup is so good! I made it last night with two apples, 20 oz of butternut squash (25% more than called for, I wanted to use up the whole package) and nearly three cups of veggie broth (again, wanted to use up the rest of my container). I think I may have also added a bit of extra ginger. The ginger makes it so warming and comforting, and it did blend up pretty thick with my immersion blender. I also didn't add marjoram because I feel that I never use up herbs and I wouldn't use it for anything else. I'm having it with a bit of heavy cream drizzled in for lunch - amazing! And you're right, very quick/easy to make.